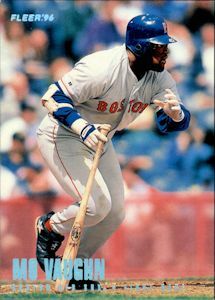 ON THIS DATE (September 24, 1996) ... Mo Vaughn hit three homers for the first time in his career. His third homer (and 44th of the season) was also his 200th hit, and the Red Sox first baseman became the first major leaguer to collect 40 homers and 200 hits since the Red Sox' Jim Rice in 1978. Most of all, though, Vaughn took control of the game as the Red Sox squashed the wobbling Orioles, 13-8, in a battle of American League wild-card contenders. For sure, Vaughn spoiled the night of David Wells, who had given up only one homer to a lefty this season. But the starter is one of many tired Orioles pitchers, and Vaughn stroked three off him, two into the screen and the third, a most fitting crunch of a blast into the Red Sox bullpen in the sixth, to put the Sox ahead for good, 6-5. Vaughn homered in the first to get the Red Sox on top, and after the Orioles took a 2-1 lead on Anderson's 47th homer in the third, Vaughn again rose to the late-season challenge. After Bill Haselman led off the bottom of the third with his seventh homer to tie the score, Jeff Frye drove in another run with a sacrifice fly and Vaughn hit a two-run homer. By night's end, Vaughn's feat had lifted him into some elite company with the Yankees' Lou Gehrig (1927), Ted Williams (1946, on the same day Cleveland player-manager Lou Boudreau implemented the "Williams' Shift"), Baltimore's Boog Powell (1966) and Chicago's Tim Raines (1994) who had been the only lefties who hit three homers in Fenway.